Youssef Ziedan grew up in Alexandria with his grandfather, studying philosophy at its university before specialising in the mystic subject of Sufism. He is now one of Egypt’s most highly respected scholars on Arabic and Islamic studies. A university professor, public lecturer, columnist and prolific author of more than 50 books, it might come as some surprise to hear that Azazeel is Ziedan’s first novel to be translated into English. Set in the 5th century AD, Ziedan’s exquisitely crafted tale follows Hypa, a Coptic monk on his journey from Upper Egypt to Alexandria and then Syria during a time of massive upheaval in the early Church. Embarking on this physical and spiritual journey, Hypa encounters the harsh temptations of the devil, Azazeel. Although often able to resist, his will occasionally bends to the strength of his desires, learning along the way that physical pleasure and spiritual enlightenment can often be two sides of the same coin. This is a novel that forces us to re-think many of our long-held beliefs and invites us to rediscover a history that for many has been lost. 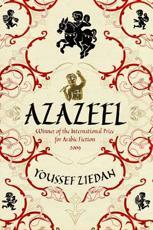 Despite the widespread uproar Ziedan’s novel has caused throughout the Middle East, sparking numerous debates about blasphemy and religious tolerance, Azazeel won the International Prize for Arabic Fiction (often dubbed the Arabic Booker Prize), and has become a phenomenal global success, selling in 15 languages. Visit Youssef Ziedan’s website here.